So I tend to get songs stuck in my head, and once there, they cycle around and around until I want to scream. Lately, the song featured in my head is “What Does the Fox Say?” by Ylvis. I like the song, but it’s ridiculously catchy. A friend of mine forced it out of my mind by bringing up ABBA’s “Dancing Queen,” but seriously, who wants that song in their head for a prolonged period of time? Today the song in my head is “Twinkle, Twinkle, Little Star.” (Yes, it’s a far cry from “What Does the Fox Say?”) It’s the tune to a Thanksgiving song I was typing up for one of our products. Good thing the song is really adorable (see below), because it’s going to be in my head all day long. It’s Thanksgiving, my oh my! Buttered rolls, and turkey legs. 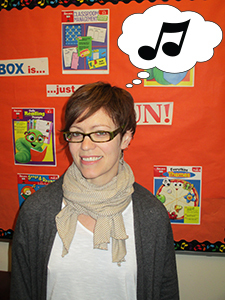 Do you use a lot of songs in your classroom? And do you find yourself singing them all day long? “What Does the Fox Say?” has been so popular lately! This past week, the theme in my preschool class was Forest Animals. We made fox masks and then sang and danced to the song. Most of the kids were already familiar with the song and seemed delighted to participate in this activity! Love the song you came up with. Years ago a friend of mine would do this all the time in her daycare according to her topics. I do it with my little friends all the time now. I teach high school students who struggle with writing and reading and used “What Does the Fox Say?” to teach a variety of literary terms, parts of speech, and persuasive writing and it worked beyond what I initially hoped. I shared with my colleagues and showed them the results and now ” What Does the Fox Say?” says SUCCESS!